Master Toshiba Laptop on centre connected with PERSEUS SDR remote receiver updating ILG Master file on dBASE. Toshiba Laptop in background is recording every 30 minutes a record of 10 seconds of all broadcasting bands. with WINDOWS 7 ULTIMATE 64bit and all have Windows XP Mode on Windows Virtual PC. All Laptops are operated with mouse or with TeamViewer software and data are transfered via LAN cable or WLAN. professional receiver from the closed German Coastal Station "Norddeich Radio" which was located at Norden. 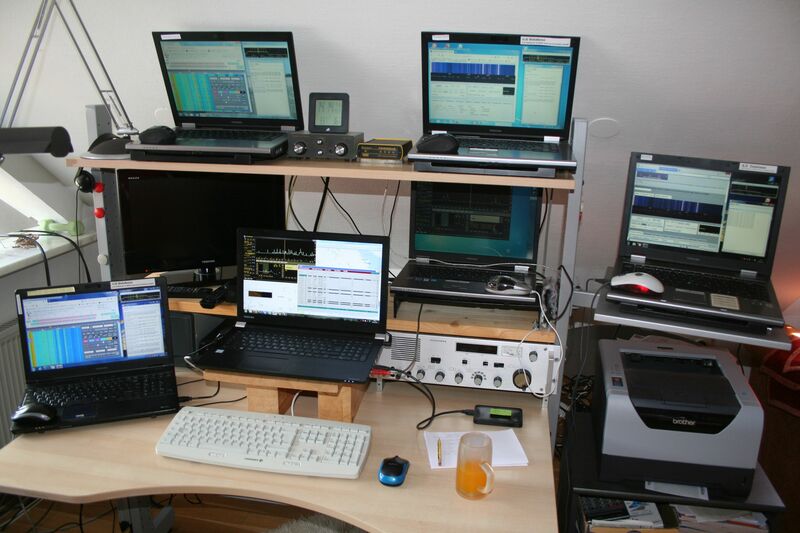 2x AOR AR7030 Receivers and 2x PERSEUS SDR Receivers, 1x JRC NRD-535G Receiver and 1x Telefunken E1506 Receiver of former "Norddeich Radio"
connected to 3x Long Wire antennas and 1x special ND antenna (RF-Systems DXPROMK2). 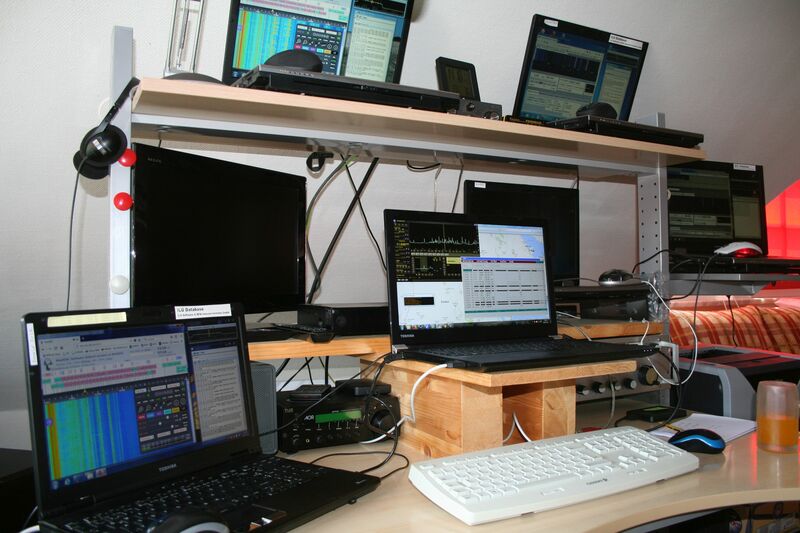 On top right Toshiba A10 laptop is doing each 30 minutes a bandscans (10 second record) 24 hours a day and 7 days a week of the 11 short wave bands. On the top left a Toshiba A9 laptop is doing a 24 hour scan of the 17 MHz band. for live bandscans in East-Asia. In the background and on the left side 20 USB hard disks (500 GB ... 2 TB) are available with a capacity of approx. 25 TB for the PERSEUS records.